KD Fasteners, Inc.’s Inconel 625 flat washers are the right choice for extreme applications. Inconel 625 flat washers offer good corrosion resistance at elevated temperatures and high-temperature stability at 2200°F. They also retain their strength and resist heat in and out of corrosive environments. This makes these flat washers perfect for applications ranging from heat shields to saltwater applications. The presence of nickel and chromium make Inconel 625 flat washers oxidation and carburization resistant. 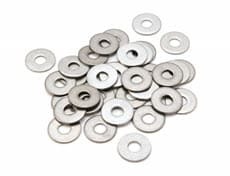 These flat washers are also resistant to a wide range of corrosive environments of unusual severity including sulfuric acid, hydrochloric acid, and phosphoric acid. The molybdenum delivers excellent fatigue strength and resistance to stress, pitting and crevice corrosion cracking even when exposed to chloride ions making it an excellent choice for seawater applications. It is commonly used in submerged applications by the Navy on submarines and boats. We offer Inconel 625 flat washers to the specific dimensions you need. Special sizes can be made to order. We offer off-the-shelf sizing ranging from 0.062 to 12 inch inside diameter and thicknesses from 0.002 to ½ inch. Whatever Inconel 625 flat washer you’re looking for, if we don’t have it on our shelf, we can quickly manufacture if for you. Our washer capabilities range from small (under 100 pieces) to large runs. We will custom make your Inconel 625 flat washers to your exact specifications. Contact us today by calling 1-800-736-5014 or filling out our contact form.